This is my article in the current Australian Leadership. It has come to mind again as I think about Fathers’ Day. “It’s mad. It’s crazy. I just don’t get it.” This week I’ve had two quite intense conversations with ministers I’ve known and respected for decades – experienced, effective church leaders – who are at their wits end with the state of the church. It’s about numerical decline, ageing, cultural change and the extraordinary levels of dysfunction and conflict that they deal with every day as they exercise their regional responsibilities. I want to say something about this. But I want to tell you about my holiday first. I think I must be last person in the English-speaking world to come to Gilead, the Pulitzer Prize winning novel by Marilynne Robinson. It’s set in 1956 in an isolated little town in Iowa. The elderly Reverend John Ames knows that he is dying and decides to write an account of his life for his seven year old son who he realises will have few memories of him once he grows into adulthood. The novel is that letter. It ranges widely across memories of his father and grandfather – both of whom were also ministers – the town and congregation that he has served so faithfully, his reflections on the experiences of war, friendship, ministry, loss, hope and grace. It is beautiful, wise and deeply moving. Reading it as a minister myself, its effect reminded me of reading Bo Giertz’ The Hammer of God many years ago. That novel tells the story of three Swedish pastors who learn by trial and error that ministry – “the cure of souls” – is at heart accepting and living out of the grace of God. Both novels are very effective short courses in the practice of ministry. But as I read Gilead I found my identification with John Ames as a minister became secondary to a much stronger identification with him as a father and a son. That may well have had to do with the fact that I’d chosen it as holiday reading in a week that my wife and I spent recently with my own parents. Because we live in different states it takes a bit of planning to make sure I see them, at least briefly, several times a year. They are in their late eighties and I treasure every opportunity to be with them. In this case we’d decided to spend a week together in the warmth of Darwin where there’d be nothing much to do but chat, nap and sample any cafés I could find with a view over the water. We did it all at their pace which, you will understand, is now very, very slow. We heard a lot of stories from their childhood and younger years – stories about their parents, what it was like being teenagers during the Second World War, their marriage and early years in Charleville. Many of the stories were familiar but a surprising number were new to me. We also learnt a lot more about how they manage the effects of ageing and how they feel about it. And all the time, in the hours designated for sleeping after lunch I was reading the Reverend John Ames’ letter to his son, working over the very same themes of family and ageing in a spiritually and theologically rich “autobiography”. Frankly, “assurance” and “comfort” have never been words that I’ve associated with that story (Genesis 21:8-21). It’s the injustice, the tragedy of it that has always held my attention. Certainly, God finally notices and responds to the distress of Hagar and Ishmael, but only after Sarah’s jealous rage – “Get rid of that slave woman and her son” – turns out to be the instrument of God’s plan. But, as usual, Marilynne Robinson’s “John Ames” discerns the grace of God in an ugly situation. I thought about my own aged parents sleeping in their nearby room. They’ve had to give one child up to the wilderness already – when my brother died unexpectedly several years ago. We’d been talking about it that week. I knew they were also contemplating what it will mean to give the rest of us up too when, like the Reverend John Ames, they come to the end of their lives. I thought about myself too. I’m also the father of a deceased son and, sooner than I’d like to accept, my parents’ passing will find me in a new wilderness. Gilead took me to this uncomfortable, unwanted place of reflection. But it took me there with a promise: there will be angels in that wilderness. But there was one more thing to come from the old minister. The words of assurance and comfort came back to me from that fictional old minister: “there will indeed be angels in that wilderness”. That is what two millenia of pastoral wisdom teaches with remarkable consistency, but each generation of pastors has to learn afresh for itself. There will be angels in this wilderness too. 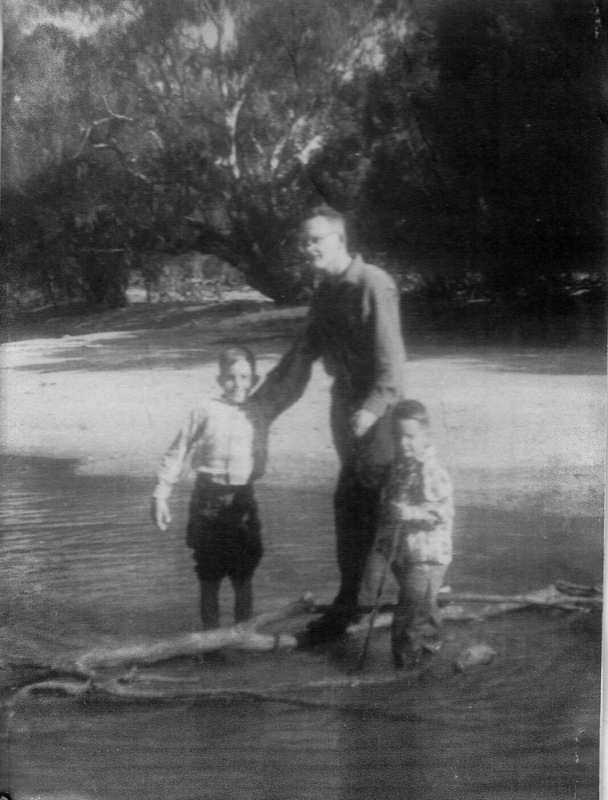 PS I’m the little one with the stick, at the Six Mile with Dad and my older brother.